KINGSTOWN – November 10, 2017: The Ministry of Agriculture in collaboration with the St. Vincent and the Grenadines Preservation Fund and the Richmond Vale Academy launched a new school based Soursop Planting Initiative at the Diamonds Government School on Thursday, November 10, 2017. The initiative, which is part of a nationwide effort by the Ministry of Agriculture, Forestry, Fisheries and Rural Transformation to introduce one million new trees to our “island-scape”, is aimed at combating the vagaries of climate change as well as providing another avenue for agricultural diversification. In this phase of the project an estimated 6,000 soursop seedlings will be available for distribution through the Richmond Vale Academy, which has been specifically chosen for the task on account of the institutions’ award winning achievements in tree planting, and other accolades for organic farming and promoting climate change adaptation measures. Speaking at the project’s launch, Louise Mitchell – one of the founders of the St. Vincent and the Grenadines Preservation Fund said her organization is keen on sensitizing the primary school students on the many benefits of the soursop plant. 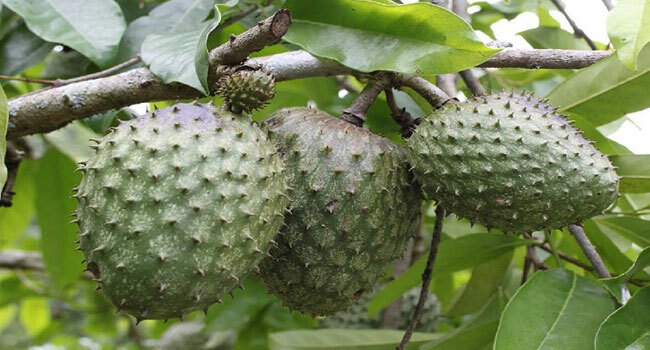 Mitchell said she was pleased to learn that the children were already well acquainted with the soursop, as responses indicated some knowledge of the plant’s use for medicinal purposes or a snack beverage. She encouraged the youngsters to become custodians and guardians to protect the future of the environment of St. Vincent and the Grenadines. Stina Herberg of the Richmond Vale Academy expressed her delight with the new soursop initiative and reaffirmed her institution’s commitment to supplying thousands more soursop seedlings within the near future. Herberg also commended the Ministry of Agriculture for prioritizing tree-planting and agricultural diversification on their agenda. Delivering the feature address, the Hon. Saboto Caesar, Minister of Agriculture, Forestry, Fisheries, Rural Transformation, Labour, Industry and Bureau of Standards noted that the Soursop initiative forms an important new pillar in the diversification strategy of St. Vincent and the Grenadines and thanked the St .Vincent and the Grenadines Preservation Fund for their injection of USD$20,000.00 towards the effort. Minister Caesar also thanked the Richmond Vale Academy for their involvement with the project, noting that they are considered one of the most reputable institutions for agro-related initiatives in St. Vincent and the Grenadines. The Soursop Planting Initiative will also be implemented in all schools across St. Vincent and the Grenadines as well as to registered farmers within the coming months.